स्पिक मैके के विश्व नृत्य दिवस के आयोजन में आगामी तेईस अप्रेल को सुबह साढ़े दस बजे प्रो.कलामंडलम लीलाम्ना अपनी प्रस्तुति देगी.शाखा समन्वयक जे.पी.भटनागर और अध्यक्ष डॉ.ए.एल.जैन ने बताया कि ये कार्यक्रम गांधी नगर स्थित विशाल अकादेमी सीनियर सेकंडरी स्कूल में होगा.स्पिक मैके के पूर्व अध्यक्ष और संस्थान निदेशक बी.डी.कुमावत के अनुसार आयोजन के तैयारिया आरम्भ हो चुकी है.प्रो.लीलाम्ना के साथ चार संगतकार भी शिरकत करेंगे.मोहिनीअट्टम की इस नृत्यांगना ने विश्व भर में बहुत से गौरवमयी कार्यक्रम दिए हैं.मूल रूप से कोट्टायम,केरला की रहने वाली लीलाम्ना ने देश की इस प्रमुख शास्त्रीय नृत्य परम्परा को बहुत आगे बढाया है.कलामंडलम स्कूल से उन्होंने भरतनाट्यम और कुचिपुड़ी में भी शिक्षा हासिल की है. Her research in Mohiniyattam is outstanding. She innovated more than 80 new steps (Adavus) for Mohiniyattam and subdivided and classified all the steps in Mohiniyattam. 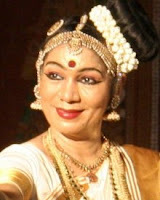 It is the first attempt by any Mohiniyattam dancer in the history of Mohiniyattam. Prof. Kalamandalam Leelamma choreographed around 100 new items, various padams, poems and dance drama for different occasions and all are performed in and outside the Country. A book on the New steps and old incorporating all prevailing steps and history of Mohiniyattam is finished and is going to be published by Kerala Kalamandalam. Now she is concentrating in performing new padams and varnams by contemporary poets in the classical style. After her work as the Head of Department of Dances and Professor in Kerala Kalamandalam (1997-2007), the pioneer institution of classical dances in the world, she is now working as Dean in the same faculty of theDeemed University.